Sign up to be notified of new postings! Mr. Gann predicts other and more important things, such as stock quotations, end of wars and elections of Presidents, with an accuracy that has made a recognized authority in Wall Street. He predicted the election of Wilson and of Harding, and he told of the abdication of the Kaiser and the end of the war to the exact date six months beforehand. His daily Supply and Demand letter gives to his clients scientific forecasts on stocks, cotton and grain. And the clients who have followed his advice for twenty years testify that eighty-five per cent of his predictions are correct. “I figure things by mathematics,” Mr. Gann explained. ”There is nothing mysterious about any of my predictions. If I have the data I can use algebra and geometry and tell exactly by the theory of cycles when a certain thing is going to occur again. Mr. Gann’s business outlook for 1923 forecasts a generally low average caused by strikes and threats of war in foreign lands and poor crop conditions. “While there will be spurts of activity and some fairly good business during the spring and late summer, the general outlook is not encouraging and there is no indication of any boom in business this year. “The foreign situation will play an important part in our business affairs as our government will have a lot of trouble on account of secret enemies in foreign countries. “From April to June a serious falling off in business and financial troubles and bank failures are indicated. During April the laboring classes will be very much dissatisfied and strikes are threatened. “During the fall a serious business depression will set in and the general outlook becomes cloudy. “The summer will see storms that will damage crops and by October business conditions will be bordering on a panic. In 1921 Mr. Gann predicted that President Harding would be a war President, and he still holds to that prediction. Mr. Gann predicted the election of Woodrow Wilson because the cycle had come back again to a man with a name beginning with W and ending with N. Washington having been the first and last President with those two letters placed in that way. The forecast which told of Harding’s election has been explained by Mr. Gann as follows:-Senator Warren G. Harding was born November 2, 1865. His name contains some of the most powerful fame and wealth-producing letters. The name Warren, beginning with W and ending with N, is very fortunate and gives him power to overcome obstacles and opponents. His name and numbers show that he will be conservative and act only after due consideration. His foreign policy will help him to win. HOW HE WORKS IT OUT. On the other hand Mr. Gann predicted the defeat of Governor Cox because his name contained only one fortunate letter. There has never been but one President with the initial C. That was Cleveland. But the letter H recurs every tenth cycle. William H. Harrison was the ninth President. R.B. Hayes was the nineteenth President, so there was nothing left but for Warren G. Harding to be the twenty-ninth. It might be well for the political parties to consult Mr. Gann before the nominations are made in 1924 to find out what letter is due to win in this election. They could then choose a man with the right kind of letters in his name. Mr. Gann gets calls every day from men and women prominent in all walks of life asking him to cast their horoscope. He tells politicians whether or not they will be elected and solves other problems for clergymen, bankers and statesmen. We have decided to release 12 charts in the coming year as a Chart of the Month package. Our goal for this package is to provide you with 12 currently traded Markets, 6 Stocks and 6 Commodities, at a low price per chart. For $1156.00 you receive 12 full size chart prints made by the hand of W.D. Gann. That is less than $100 per chart. Boeing, Chase National Bank, Chrysler, Coca-Cola, General Electric, General Motors, Paramount, and Warner Brothers for the stocks. We are also considering adding a wildcard chart to the package. One of W.D. Gann’s Lottery charts. Let us know if you are interested in seeing one of these rarities in the package. July Cocoa, Spot Cotton, July Corn, May Coffee, Soybeans and Wheat for the commodities. These will be a mix of monthly and weekly charts. You’ll note that there are more stocks than 6 there-it’s because we need your help deciding.. Please let us know which stocks and commodities you would like to see included in this package. While we tune in this package we will be offering it to our clients for the price of $999.00. As soon as we send our first package, the sale price will disappear. Purchase the package now here. We hope to ship three of your charts as close to September 21st as possible, with three more coming every 3 months. One shipping price will get you 4 quarterly packages. These charts will be available individually, but they will be priced at $175+ per chart. Which edition of “How to Make Profits in Commodities” do you have? Did you know there are eight different editions of W.D. Gann’s “How to Make Profits in Commodities”? While the last five editions are very similar except for dust jackets and printing number, the two I am going to tell you about may surprise you. In 1951, W.D. 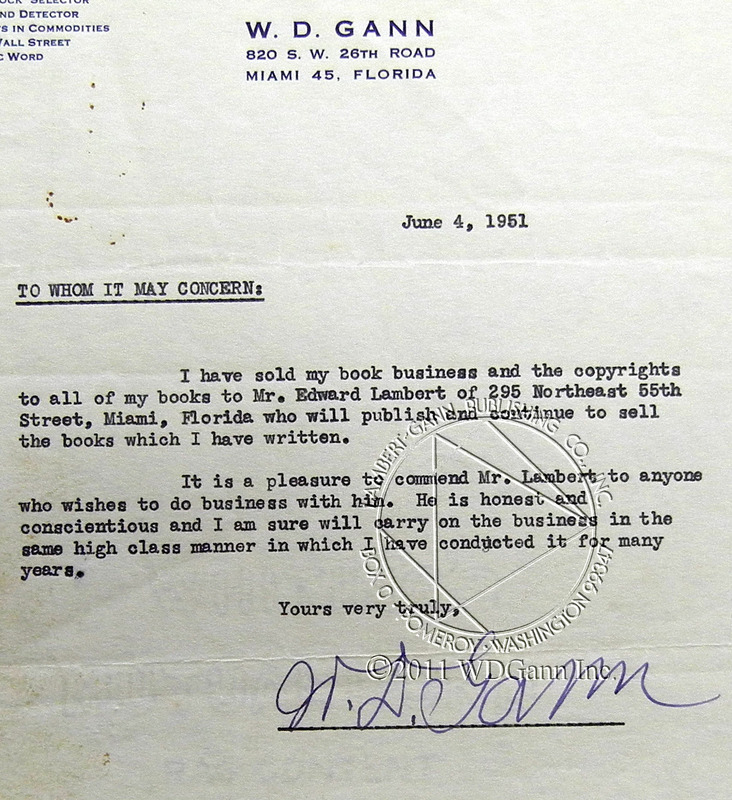 Gann sold his book business and copyrights to Ed Lambert, his partner. They had printed an edition of “How to Make Profits in Commodities” at the same time. As part of the business deal, W.D. Gann updated “How to Make Profits in Commodities” with forecasts of the coming years. A total of eight charts in the back of the book were changed showing forecasts for the next 5 years! Quite a confident and calculated move. Would you purchase a book showing a reliable forecast for the next 5 years? The updated charts included May Corn, November Soybeans, Coffee, October Cotton, Cotton Seed Oil, October Eggs, Rubber, and May Wheat. Did the forecasts come true?? How did W.D.Gann come up with these forecasts? The Ephemeris, his master cycle charts, or his mechanical method as explained in the Commodity Course? That is up to you to find out-Let us know with a comment what your findings are. 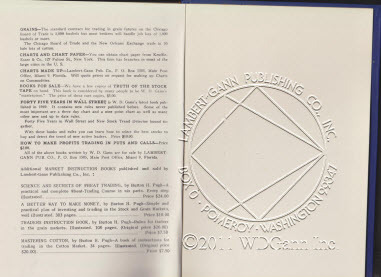 So Ed Lambert, the copyright holder, printed out a second version of the 1951 “How to Make Profits in Commodities” with the updated charts in the same year. THERE ARE TWO 1951 EDITIONS! It’s not as easy as looking at the copyright page-as they are EXACTLY THE SAME. The biggest difference is the addition of the forecasts, but there is an easier way to tell which version you have. What color is the cover of the book? Blue or Purple? 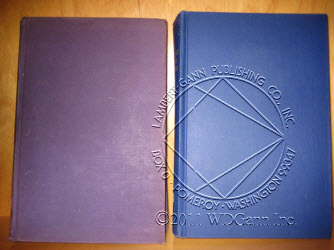 The purple book is the earlier 1951 edition. There are also variations in the placement of page numbers over the updated charts. Lastly, Ed Lambert changed the advertising in the rear of the book. Below are pictures illustrating some of these differences between the two 1951 versions, note the binding colors. To purchase the latest version of “How to Make Profits in Commodities”, CLICK HERE. W.D. 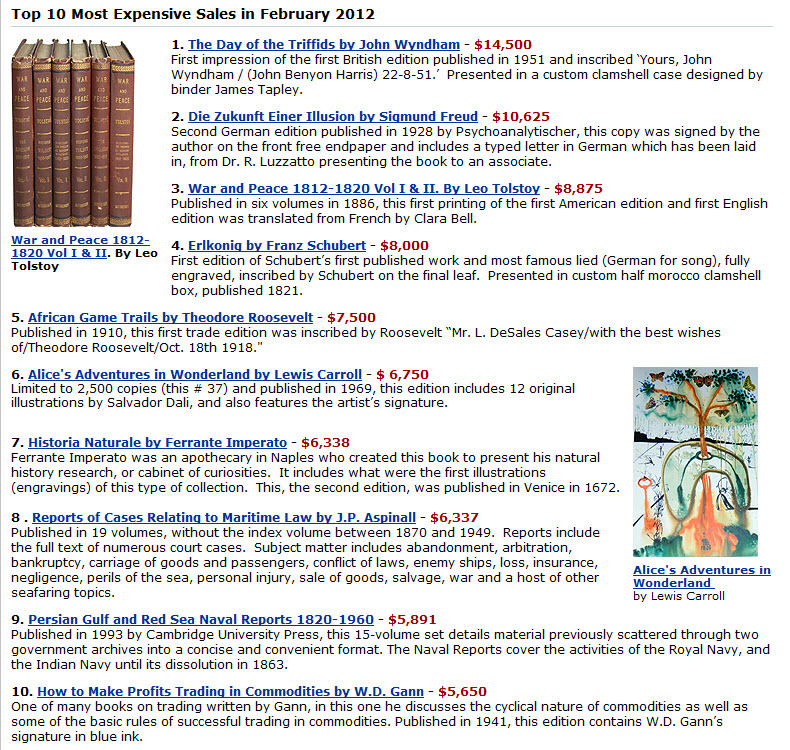 Gann made Abebooks top 10 most expensive sales! Wow, who got it? W.D. 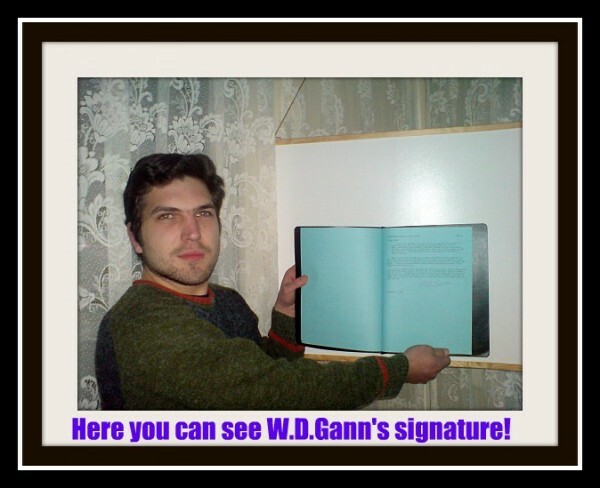 Gann’s signature is quite rare. One of our primary goals is preserving W.D. Gann’s working materials. 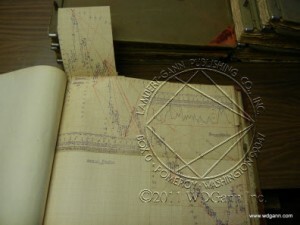 We are forever preserving the December Cotton charts, made by W.D. Gann, by scanning and reprinting them for you. W.D. 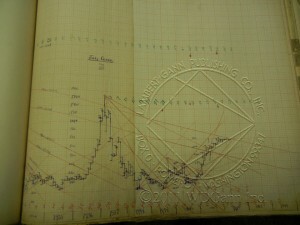 Gann made thousands of charts throughout his lifetime. Some were studies, others for keeping data, and others for forecasting and trading. 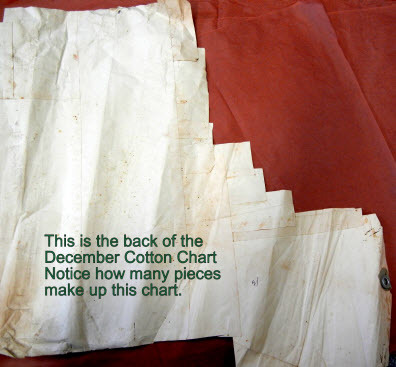 The December Cotton Chart Package contains two weekly charts containing the same dates. One was kept in a binder, and the other was rolled up and obviously pieced together as the market was trading. W.D. 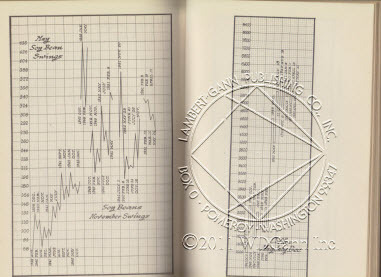 Gann used binders to hold most of his stock and commodity charts, but there were hundreds more loose charts and many rolled up charts as well. Many trunks of rolled up and stacked charts are part of Gann’s legacy. This chart was one found in one of the trunks, rolled up and a bit rough around the edges. It was very well used and exhibits the tell tale grease marks from being rolled and held in the hand for extended periods of time. It is fascinating to view the difference between the two weekly charts contained in this 4 or 5 chart package. Our most recent chart release from the vault is the Anaconda Mining Company package. This is a special set due to many factors. Anaconda’s connection to precious metals, wealthy and powerful people, and it’s strange link to W.D. Gann make this an interesting study. Five charts are included in this massive set for your study. We have also released from the vault a reproduction of the newspaper containing a little known interview with W.D. Gann. The 1919 article deals with numerology and politics and may be quite different from anything you have read before. Anaconda is mentioned in “Truth of the Stock Tape” as well. Heavy manipulation was at play with the Anaconda Stock and you can see that Gann was forecasting and trading Anaconda regardless of this. The study of past charts, and chart patterns is a very good way for you to improve your future. See the chart package here. “If only I had a copy of W.D. Gann’s Ephemeris” – those words I have spoken so many times and now after 6 years of intense study, my wish has been granted. The timing is perfect, as Nikki Jones mentions in the preface of the book, something told her it was time to release Gann’s private ephemeris. W.D. 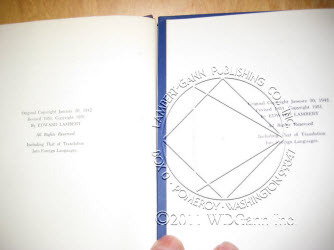 Gann published his coded novel “The Tunnel Thru the Air” in 1927, now in 2011 some 84 years later and a complete Uranus revolution- we have access to his private notes and comments. 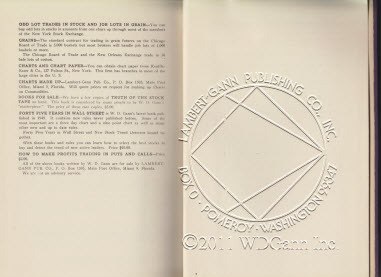 If you look very carefully, you’ll even unearth why Gann also called his novel – Looking Back from 1940. You will also discover some Biblical cycles and counts he was using to study the War cycles. There are numerous recorded dates of his Lottery wins, but many cluster in a specific period obviously in tune with a lucky astrological period. Significant celestial phenomena is underlined and highlighted, often with specific comments. There is a clear indication of the planets Gann was tracking and also a very special calculation in the side panels for nearly all the months. His notes reveal his application of planetary midpoints, declinations, Heliocentric transits and the Lunar Nodes. I was pleasantly surprised when I reached the final page of the book to find a pouch with some extra inserts uncovered in certain parts of the Gann’s private ephemeris: a projection for 1949, two passages from the Bible and some detailed instructions on using planetary cycles and aspects. There are also many personal entries like when he bought his cars, when he was elected on the Chicago Board of Trade, when his family members were born or died, days he opened and closed certain contracts and even one day when he fell and hurt himself. I want to sincerely thank Nikki Jones for releasing Gann’s private Ephemeris so that serious Gann students can follow the steps of his Esoteric Mastery and find links to those puzzles we’ve had to speculate upon in the past. It is also time for those in denial to accept that W.D. Gann was a Master Astrologer and open their minds to another dimension in cycle analysis. Uranus is the planet of awakening and astrology soon to ingress into Aries, starting the seeding time again in the Spring phase of its cycle. Such an apt biblical passage found inside the book. Shipping in a few Weeks! W.D. Gann used the Raphael Planetary Ephemeris as his personal Diary. In these ephemerides he kept his notations on commodities and stocks and the expectation of their movements. He also kept business and personal notes in these books. Some Interesting entries show that he won many lotteries. There are complete sets of books, charts and records he kept on the Havana Lottery. On the left hand page of the ephemeris copied in this issue, you can see the notations such as “won 21, won on 71 and 07″. In his ephemeris for the years 1940-1950 are some interesting notations such as his “war day” records. On each page after World War II started he kept a record of war days. In April of 1945 he had the notation “end of war coming”. As everyone knows Germany surrendered in May and Japan in August, 1945. Please note the May Soybean chart of Gann’s in this issue. You will notice the signs for the planets Jupiter and Mars. (I have circled them on the chart.) Jupiter’s sign looks like a fancy 4 and Mars’ sign is a circle withe an arrow on top. You can see that there are lines extending from the signs and these lines cross on December 1, 1948. Also reproduced in this issue are pages from Gann’s Ephemeris for December 1948. On the right hand page you can see that Gann had the degrees for Jupiter and Mars circled on December 1, 1948. In the upper right hand corner under Mutual Aspects it shows that on December 1st, Jupiter and Mars are conjunct. May Soybeans made their final high at this point and then began a long down trend. Gann knew what was going to happen to the market. The records show him to be short soybeans through December 1948 and January 1949. Gann did not advertise the fact that he used astrology. During his time, just as it is today, the majority of people in the world had a hard time relation to this planetary science. It goes back to a basic fear of the unknown..
Reprinted from “The W.D.Gann Technical Review” available here. Purchase W.D. 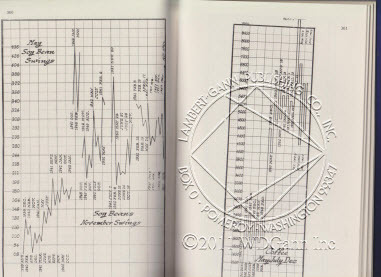 Gann’s Private Ephemeris 1940-1950 here. Only 400 copies will ever be made. The Grand Prize winner of the Course hand-signed by W.D. Gann is Tsvetan Kashinski! Recently we randomly selected three names out of the thousands who entered to win the very rare signed course by W.D. Gann. Here’s more about the lucky winners. Tsvetan Kashinski is a 22 year old student living in Bulgaria. He is studying Computer Science and Networking. 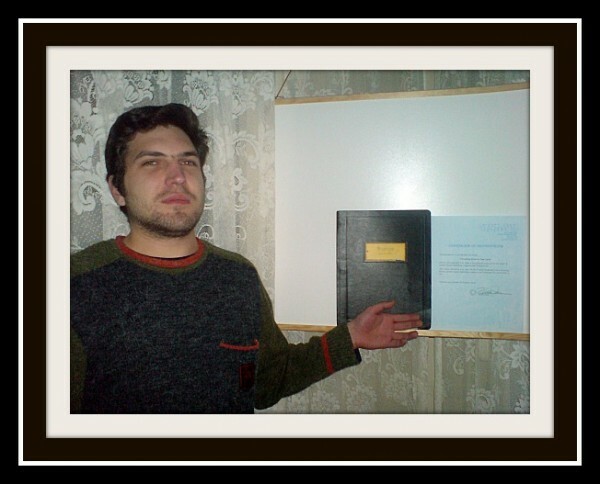 He has been studying financial markets and trading for two years. Tsvetan came across W.D.Gann in his search for forecasting and trading tools and found similarities in Gann’s methodologies and practices. Tsvetan says the Bulgarian agriculture consists of wheat and corn near his city. He plans to begin studying the futures market in closer detail. He also is very interested in the wellbeing of his spiritual, physical, and mental faculties, much like W.D. Gann. We will keep in touch with Tsvetan and let you know his progress. A big thanks to our friends at GATE and Market Analyst for their generosity! Over the years I have been true to the Gann material that I knew was entrusted to me. I haven’t always been able to describe, nor explain many of the items I have. All I can tell you is that something has told me, “ it is time” to release this material. Writing about Mr. Gann’s Ephemeris, all I have are memories—and that’s what this thing is going to be. This is why I have asked a trusted friend to help me write a description that will describe these volume’s to you so they will be an asset to your trading. I can’t say I saw Ed Lambert hand these volumes to Billy. All I remember is Ed really getting upset when certain boxes of books were uncovered and packed to the awaiting truck and impatient driver. I could write pages on Mr. Lambert however that is another story. Ed shook and sweated and he was not really sure if this material, that had been buried for so long, should be part of the deal he & Billy had made. Time was up, the door of the truck closed and it was on its way to Washington State. I remember three extremely affluent men at our farm. I was serving tea in the office when I heard the words,” loan or borrow” as they were looking at the bookshelves. I do know that years later as I sat alone in the office of Lambert-Gann looking for material to help me understand anything, a letter appeared in a drawer I swear I had looked in dozens of times. It was a letter from one of the original three that had visited Billy. He spoke of the Ephemeris and I believe that was as far as I read. I reached for the phone, immediately called. Unaware the phone was answered on the other side of the world. Splutters, excuses, and “oh, yes, there was a meeting tonight” and “oh, yes, I can bring the Ephemeris”—the exchange was made and the Ephemeris after being absent for many years flew back home. It has been safely locked away since then. That God has been unkind. And gird me for tomorrow’s chance. An ephemeris is a table of values that gives the positions of astronomical objects in the sky at a given time or times. The Raphael ephemeris gives the apparent geocentric positions of the Sun, Moon and planets, as seen as from the center of the earth. The Raphael ephemeris tables the ASPECTS, ZODIACAL SIGNS and PLANETS along with ECLIPSES and other PHENOMENA on a given date. There is a lot written during the time period of the Ephemeris 1941 to 1950. See further extracts from “The Tunnel Thru The Air” as to astrological points. Read the book, see the forecasts and build the charts for yourself. It may help you to understand how W.D. 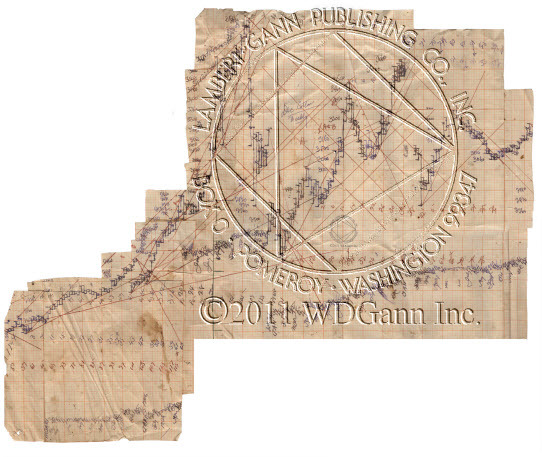 Gann applied the facts or Phenomena from the Ephemeris on the specific dates he included in the book. On June 6th 1951 “How to Make Profits in Commodities” was published. A careful comparison of the two editions shows up some very interesting changes. For example, why are the charts on pages 359 to 366 revised and showing swings long past W.D Gann’s publication date of 1951 and his death in 1955? He was clearly making Forecasts using an EPHEMERIS. Read the book, see the forecasts and build the charts for yourself. Again it may help you to understand how W.D.Gann was working. In particular read Chapter VIII, pages 82 to 89. The chapter is called “Months When Extreme Highs and Lows Were Recorded”. Below are some extracts and references contained in “The Tunnel Thru The Air, or Looking Back From 1940” that clearly identify W.D Gann was using Astrology and Data coming from the tables in an Ephemeris. This story is founded on facts and events, many of which have happened or will happen in the future. It has been well said that truth is stranger than fiction. Second, It teaches a moral lesson and proves the Natural laws laid down in the Bible. Third, It shows the value of science, foreknowledge and preparedness. I believe in the stars, I believe in astrology, and I have figured out my destiny. I have demonstrated this to mean that the planets rule our Destinies. His calculations showed that wheat and cotton should be top for a reaction on June 10th so he wired his broker in New York to sell out his wheat and cotton. Corn was down that morning, so he telegraphed the broker to buy 20,000 bushels of September corn. After sending this telegram, he glanced over the morning paper and saw an advertisement headed, “Professor O. 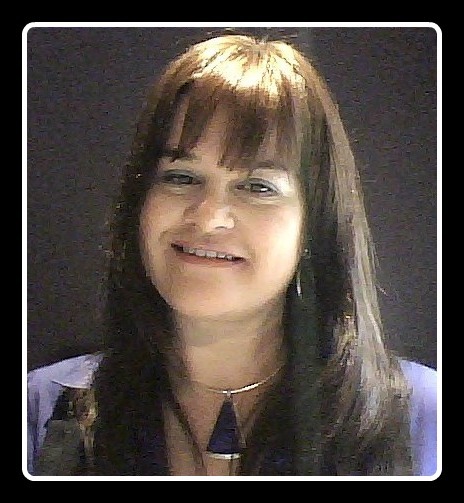 B. Joyful, ”Astrologer. The works of the Lord are great, sought out of all them that have pleasure therein. He had made notes as he read the Bible at different times where it referred to Astrology or the signs in the heavens and was thoroughly convinced that the influence of the heavenly bodies govern our lives. Throughout “The tunnel thru the air” there are extensive references to CYCLES, PAST and FUTURE, MAJOR and MINOR CYCLES, references to the SUN, MOON, MARS, SATURN,VENUS, URANUS, JUPITER, CHANGING SIGNS, ASPECTS, CONJUNCTIONS, TRANSITS AND MUCH MUCH MORE. Will you be one of the 400 people in the world to own this treasure? Click here to buy W.D.Gann’s Private Ephemeris now.